Has abolishing the discount for upfront payment of student contributions made a difference to upfront payment rates? 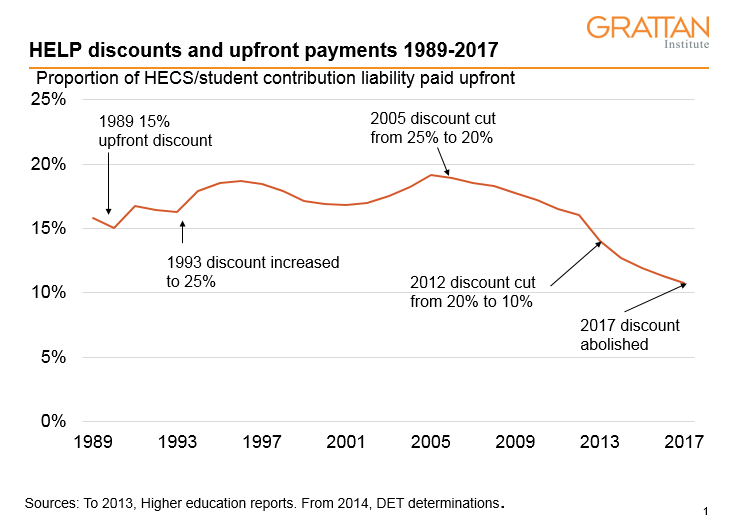 An article in The Conversation on incentives around student contribution payments made me wonder what difference the 2017 abolition of the 10 per cent discount for paying upfront was having. The discount had a cost to taxpayers, since universities were compensated by the Department for upfront payment discounts. If students pay upfront, the risk of the remaining debt not being repaid is removed, as is the interest subsidy for the time that repaid debt is outstanding. The discount is only worthwhile from a taxpayer perspective if it induces upfront payments on a sufficient scale to reduce doubtful debt and interest subsidies by more than the cost of the compensation to universities. At the time, I supported the decision to abolish the discount, because I doubted that it was generating a net financial benefit for taxpayers. One reason for this is that various sources of evidence over the years suggested that upfront payments were coming from sources unlikely to be very sensitive to discounts. These include parents wanting their kids to be free of debt, employers, and scholarships. In the 2012 student finances survey, for example, 9 per cent of undergraduates reported receiving money to pay tuition fees. While abolishing the discount removes any financial incentive for students who will personally hold the debt to pay upfront, some may still choose to do so because they want to be debt free, or for students who already have jobs paying above the HELP repayment threshold wanting to avoid entering the repayment bureaucracy. These students are likely to be part-time, so the student contributions may only be a few thousand dollars a year, similar to or perhaps less their annual HELP repayments (although antiquated repayment rules mean that they will still be able to delay payment interest free for a year). It may be a little early to judge what impact abolishing the discount will have. As the chart below shows, there is a history of policy changes to the discount not having immediate large impacts (indeed, some are the opposite direction to the one expected). This may be because it takes a while for information about the policy change to trigger behaviour change, particularly for later-year students who may have established habits of paying upfront without paying much attention to the incentives. Between 2016 and 2017, the proportion of student contribution charges paid upfront dropped from 11.35 per cent to 10.77 per cent. The changed policy might have made a difference, but this drop is also consistent with a long-term trend, and indeed the drop between 2016 and 2017 is the smallest since 2012. So far, I would say the taxpayer is likely to be ahead. If upfront payments in 2017 had been made at the same rate as in 2016, $569 million would have been paid. Instead, payments were $540 million. The taxpayer has avoided $54 million in upfront discount compensation, at the price of having (at most) an extra $29 million exposed to doubtful debt risk and interest subsidy costs. On current estimates, about 75-80 per cent of that money has a good chance of being repaid. The saving is small in the context of HELP’s total finances, but worth having. Thankyou Andrew for your thorough response and generally for your engagement with this area. I suppose I am wanting to apply a behavioural economics lens to this issue to complement the economics. While the overall numbers perhaps don’t justify bringing back the discounts (although your graph seems to suggest that it could? ), bringing forward an improved cash flow position is sometimes more valuable, to government and to the household. Personally, for me, with a hefty HECS debt looking to justify making a lump sum payment to free up cash flow, it is a dilemma. In any case, more work could be done on understanding how debtors might change their behaviour in response to a change in the discount settings, along with consideration of a communication strategy. Tracey – I think a big discount probably would affect behaviour a bit, but at a net cost to the government. I have long been concerned that students seem to take on HELP debt too readily. So a behavioural economics approach might be useful. Your point that students are now reminded less of how much they owe is a good one. As parents of university aged children, we’d like to just pay the fees upfront, but if we are going to be penalised, we might as well get our children to have the debt and pay them overtime to save the money. Your analysis is ignoring the costs to the taxpayer of administering the debt for people who would otherwise not have it, and the costs to the student and parents of having to analyse to the nth degree whether it’s worthwhile chasing a couple of hundred dollars. With no discount it becomes a couple of thousand dollars that can be saved, so we might as well get the taxpayer to pay the administration costs. Governments should try to make efficient systems in total, and increase tax rates if necessary, rather than trying to minimise their costs at a higher cost to the taxpayers.